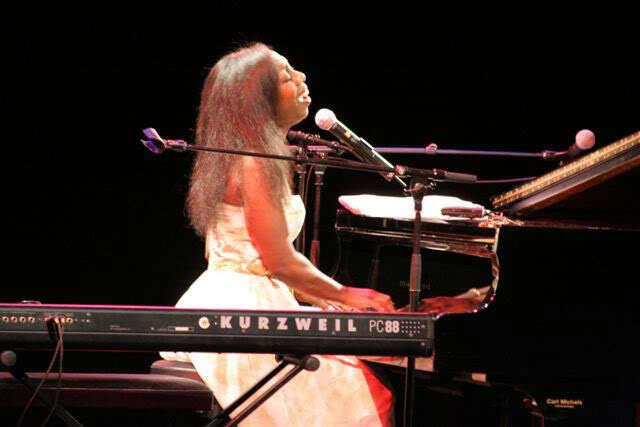 When it comes to powerful singing, Oleta Adams comes to mind immediately. Her million-selling hits, Circle of Oneand Get Here remain legendary favorites to pop and jazz music aficionados. She dazzles audiences around the world with her performances, having appeared with Phil Collins, Luther Vandross, Michael Bolton and many more artists in sell out concerts over the years. Adams is a three time Grammy nominee performer, yes, a songwriter as well. Her smooth, soulful sounds will enlighten the One World Theatre in Austin and here, we get up close and personal with the champagne chanteuse on singing with her idols, her future with Broadway and how she maintains balance in her life. Lance Avery Morgan: Oleta, we all know you are a dynamite singer, yet many may not know that you write many of your songs, too. Tell me about what it’s like to sing what you write. Oleta Adams: I think it comes from a deeper place and because of that, the songs take on more meaning for me. I can offer another dimension of myself besides singing. Plus, I try to write about things I have thought carefully about and perhaps I can help people figure out answers to their problems. LAM: Your songs are indeed soulful. And you perform live all over the world. Is the energy the audience gives you important – do you feed off of that? OA: Absolutely - that’s the way we singers keep going. Different audiences respond directly, because of cultures, venues… you name it. OA: He’s so gracious and it was fun doing the big band thing with him because jazz is his passion. And it was fun for me to sing with 16 horns. Are you kidding? He loves music and you can tell that in his performances. When you find musicians who pursue different things so they don’t get bored, like Phil does, that’s amazing. LAM: And you performed with the late Luther Vandross – you two were close friends, right? OA: We were and he was so warm. I miss him. He respected us and really appreciated talent as a fellow musician. Being around him you got a joy because he was so talented and touring with him was a treasure. LAM: With touring so much, how do you unwind and find balance when you get the opportunity? OA: That’s easy. I love being a housewife – watching HGTV, scrap booking, anything creative… sewing, gardening. That’s the artistic part of me and seeing if I can create something. I’m also very involved with my church. That really brings you back to earth, you know…from baking cookies, to being a greeter, to playing at a service. For me it’s a 24/7 thing, not just a Sunday morning thing, that molds who I am and every part of me. LAM: You’ve earned several Grammy nominations – tell me how it feels to be recognized by your peers? OA: When you consider how many other people are out there doing the same thing, having any recognition like that is remarkable to me. You know, I’ve never had a regular job in my life. I’m very blessed doing what I have a passion for. OA: Playing the Hollywood Bowl with Cleo Laine was wonderful. Playing those large places are so fulfilling because it helps me feel very glad to reach those watershed moments in my life and that people appreciate it. Most people want to make a contribution to the rest of the world. It encourages me to keep going and it’s really the icing on the cake. And I’m just as happy playing little hole in the wall places, too. LAM: You’re also a big Broadway fan – since you starred in a local version of Hello, Dolly! – I hear you want to write one yourself. OA: I know that Broadway is another animal and perhaps it’s because I do have an appreciation for the great musical’s like Brigadoon, Carousel, The King & Ibecause it’s good fun and great drama and music that entertained. I recently saw The Color Purple and it was superb. LAM: On another note, you’re performing at One World Theatre, almost like a private venue in scope - with 300 seats – do you enjoy performing in Texas? OA: I love Austin and my first time to your state was a couple of years ago. I love that it’s a music town, too. One World is like a private theatre because it is so intimate. Hartt Stearns and Illuminada and the rest of the people are there because they want to be. LAM: What do you love to do when you come here? Good food and good company. OA: You released a holiday album recently that we can find later this year, too? Right, and it’s the first one I produced on my own. I sing the songs that touched our lives growing up at Christmas. I asked my friends what their favorites were, so I didn’t write any songs for this, but I discovered I had abilities I never knew I had in reinterpreting them.